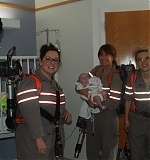 Yesterday, the cast of the new Ghostbusters visited the Tufts Medical Center in Boston. 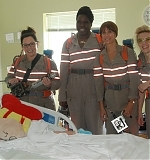 In full movie attire with matching backpacks, the cast including Kristen Wiig, Melissa McCarthy, Kate McKinnon and Leslie Jones entered hospital rooms to talk with patients and their respective families. 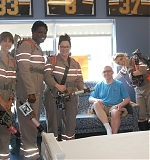 Some visits even called for an impromptu check under beds and mock scans to make sure there weren’t any ghosts roaming through the halls. Such a nice thing to do, and I bet they all had a lot of fun during the visit. Pictures from the visit can be seen in our photo gallery.